How things can change up here… As I am sure you remember, last Sunday I threw out a challenge to our dear friend Mother Nature. I challenged her to break my will for snow. To bring it so fast as furious all season that I would be begging for it to stop. She seemed to get the message and did not waste time beginning her challenge. Monday remained mild, in fact, we had thunderstorms roll through Monday evening. Some good boomers too. Very strange for December 4th. Anyway, the thunderstorms did herald the arrival of colder air and that colder air changed our rains to snows early Tuesday morning. Once the change over happened, there was no going back. It was off to the races. By sunrise, we already had a few inches on the ground and it was still coming down good. 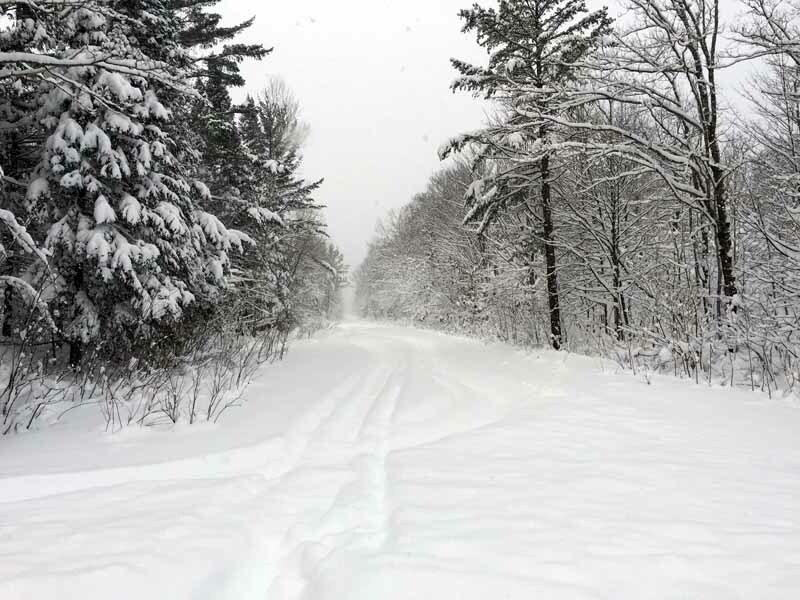 Even though the roads were not impassable, school was called for the day because things were just going to go down hill all day, with the heavy snow to continue, along with very strong winds. I did venture out in the early afternoon to go to the bank and post office in Mohawk and my plans were to head down to Calumet to take care of some business. However, it was snowing and blowing enough that I decided it best to just go home and not down to Calumet. It is a pretty rare occasion in which I decide not to drive somewhere because of snow and/or blowing snow. However, things were pretty bad. 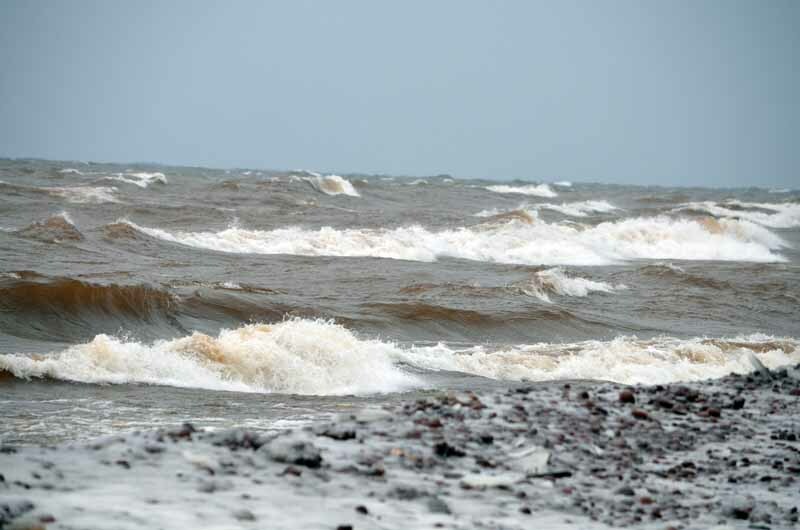 At times, the winds gusted to 55 mph and sent visibility down to just a few feet. At best, the visibility would climb to around 1/8th of a mile. So we all just hunkered down for the afternoon and evening and the girls all hoped for another snow day on Wednesday! The winds and snow kept up pretty decently through Tuesday night into Wednesday morning. There had not been a ton of new snow since sunset, but with the strong winds continuing, there were some monster drifts that had formed and despite the fact that we have the best plow crews in the nation up here, they could not promise that they would be able to open up all the country roads in time for buses to make their rounds, so the girls hopes of another snow day came true for Wednesday. The snows and winds did let up enough that we were able to get out of the house and take a drive Wednesday afternoon. The plan was to head down to the big lake to see how she was liking the storm. On the way down, we stopped at spot along the road where you can take in a nice view of the Eagle River. 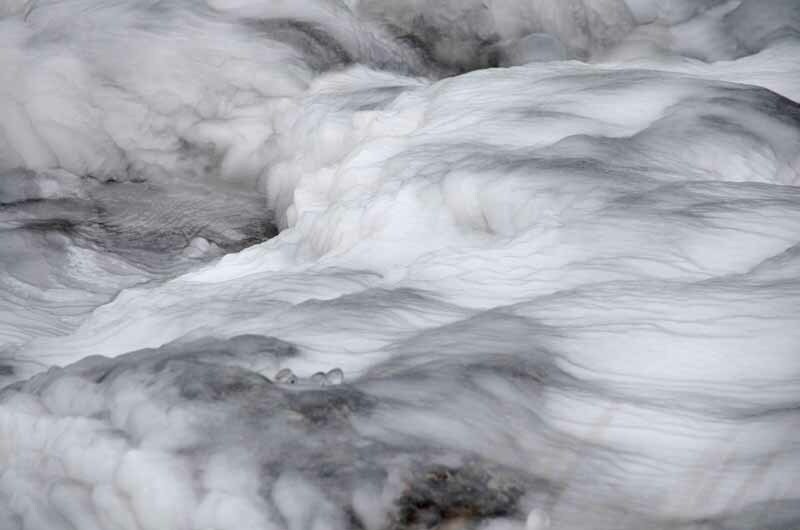 There are some neat falls in that spot, but they are kind of strung out and hard for one single photo to capture. Thank goodness for the panorama feature on my phone, as I was able to capture a 180 degree view of what I was taking in. We got to the big lake and she was pretty stirred up. Not as bad as it probably was the day before or in some of the other big blows we have had, but still plenty rough. 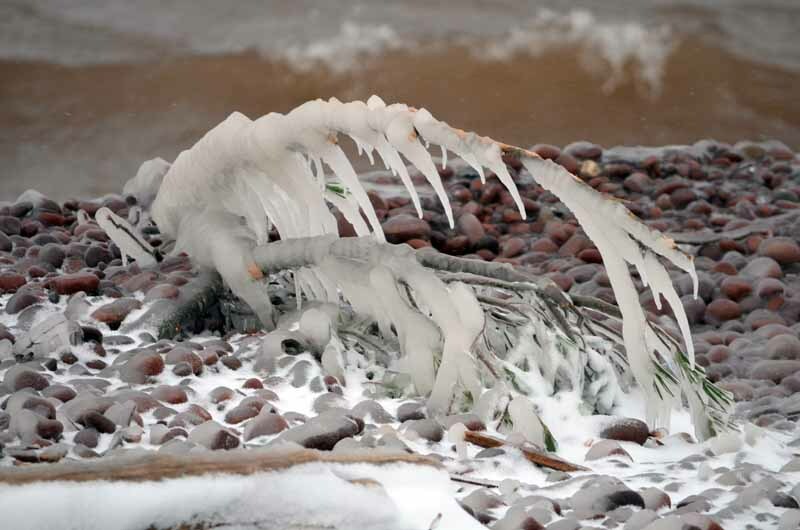 Another thing I was hoping to see was some neat ice formations caused by the water being splashed up onto shore and then freezing. It did not take long at all to see the first example of that. A little further up the coast, the ice formations got more dramatic and impressive. 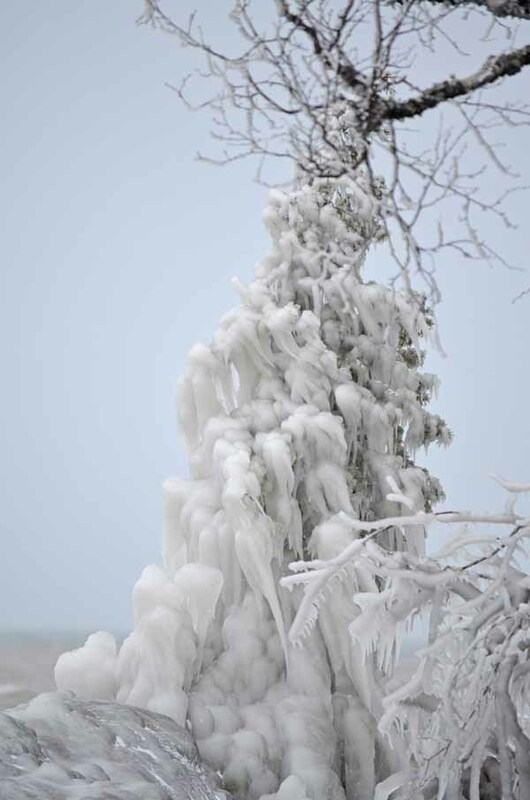 The coolest thing I saw was a pine totally encrusted in ice. Makes you wonder if when all that ice melts, will it take out any branches, or was it added in a way in which the ice is supporting itself? In either case, there was little doubt that the weather conditions that caused that to occur were pretty harsh. This next shot reminds me of a moonscape, or perhaps the surface of Pluto. 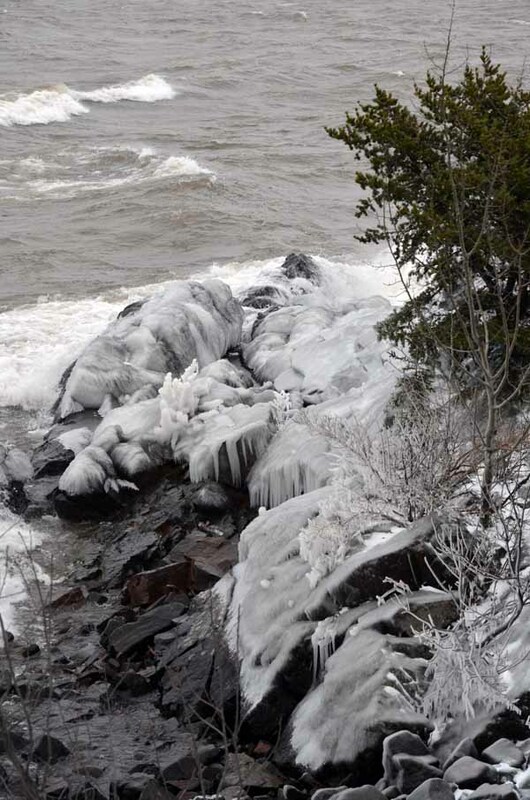 Nope, it was just a coating of ice on a big rock along the Lake Superior shoreline. 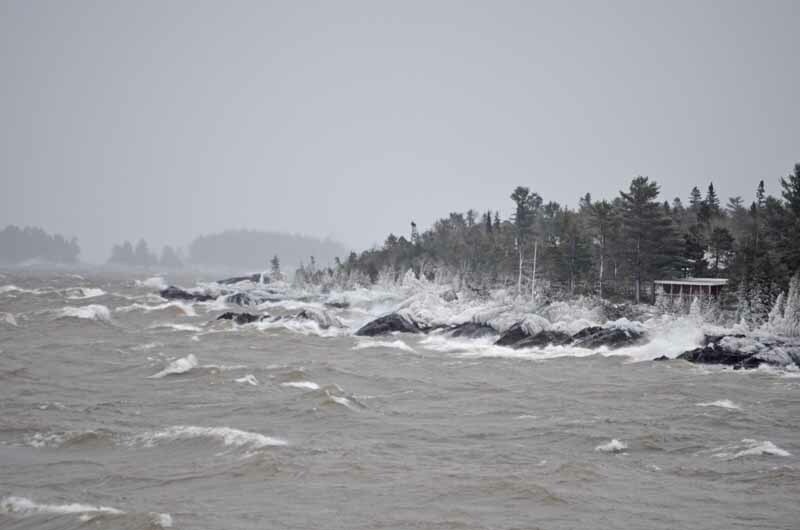 We made it to Eagle Harbor and drove over to the light house, thinking there might be some near ice formations there, but not much that could be seen from the observation deck they have there. 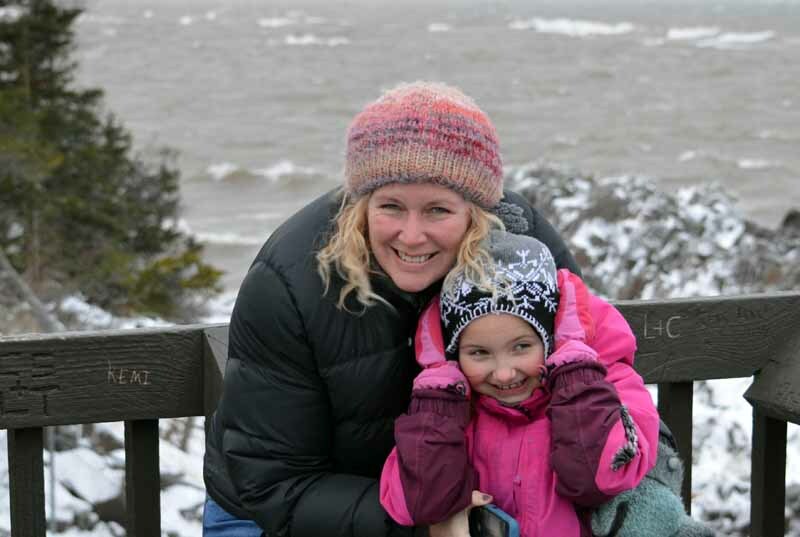 I speculate that from the other side of the lighthouse, there might have been some neat things to see, but with the winds still blowing strong and temps in the teens, I quickly snapped a shot of the girls and then took a quick shot of the frozen shoreline east of the harbor entrance. Once that was done, we all scrambled for the warmth of the vehicle and started making our way home. 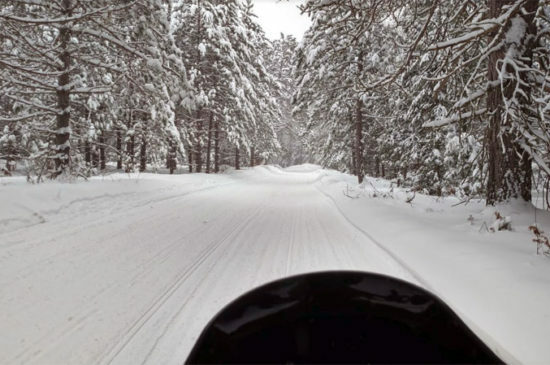 When we got to where the snowmobile trail crosses the highway near Phoenix, we pulled over so I could take a picture of the trail. Much to my surprise, the groomer had been through since we passed on our way out to the lake and had panned the new snow. 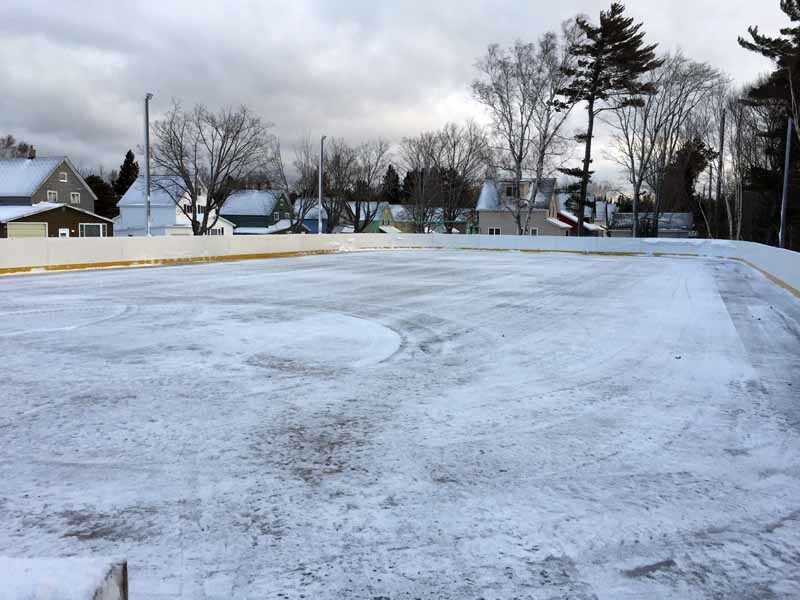 With the temps being cold and the forecast calling for more, it was determined that it looked like a good time to start making ice at the local rink in Ahmeek Location. So Thursday morning, I headed over with Big Red to do the first clearing of the season. 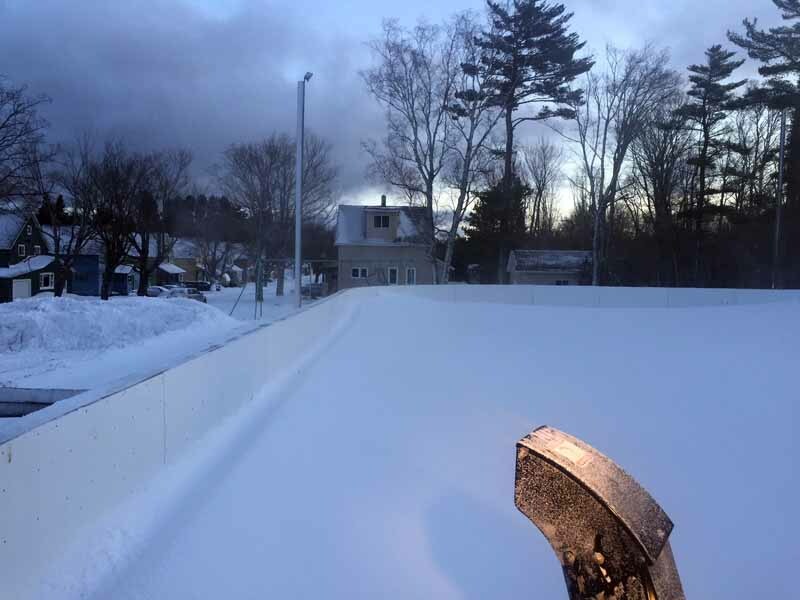 The rink looked like it had been abandoned for years, with the snow piled up against the boards. Strange to think that just 4 days earlier, there was not a lick of snow on it. In the northeast corner, the snow had actually drifted right up to the top of the boards. The snow was quite light in its density and Big Red made fairly quick work of clearing the snow off the rink. 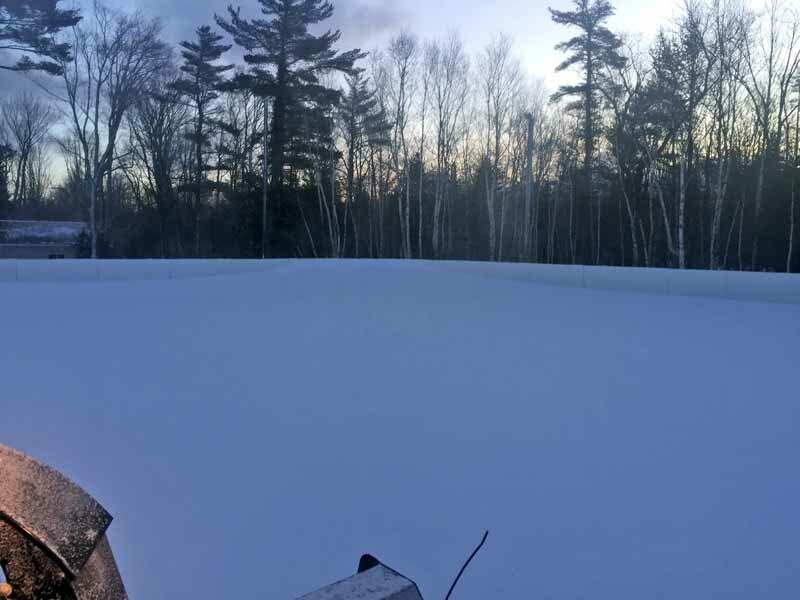 Unfortunately for the start of the rink, more snows came that day, so the flooding process was put off for another day. I did get over there on Friday and cleared it off and 2 floods were put on it. We repeated that process on Saturday, so it should be pretty close to being ready. 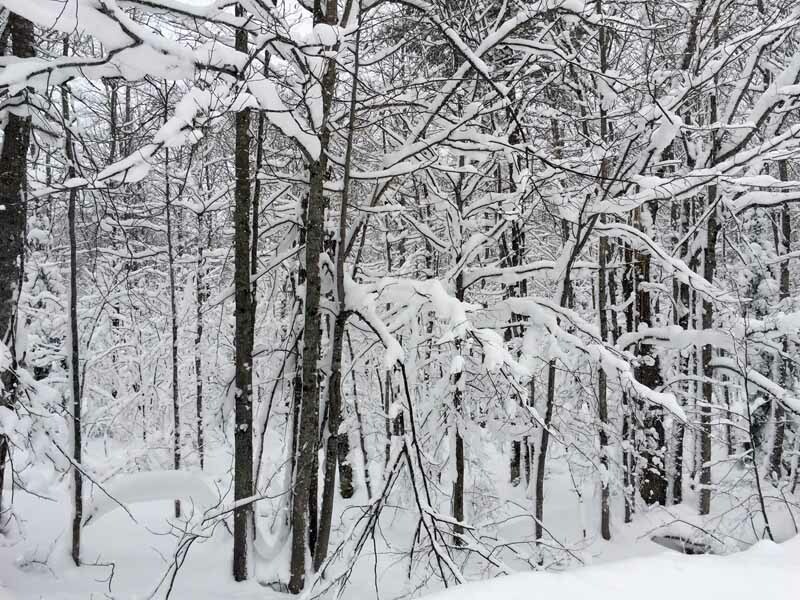 Friday morning we awoke to a fresh 9-10 inches of snow. It it always neat to flick on the outside lights and see that a bunch of new snow has fallen overnight. 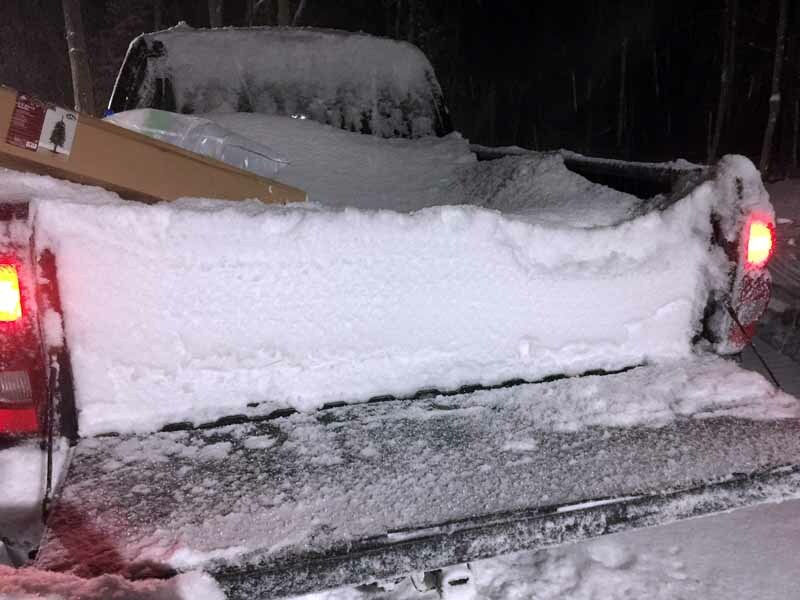 Friday morning is our time for garbage pick up, so I always have to run it out to the end of the driveway, only this time, when I dropped the tailgate to put the can into the bed of the truck, the bed was already filled up! So the can got to ride on the tailgate this time. Saturday I drove down to Greenland to attend the open house at Pat’s Motorsports. 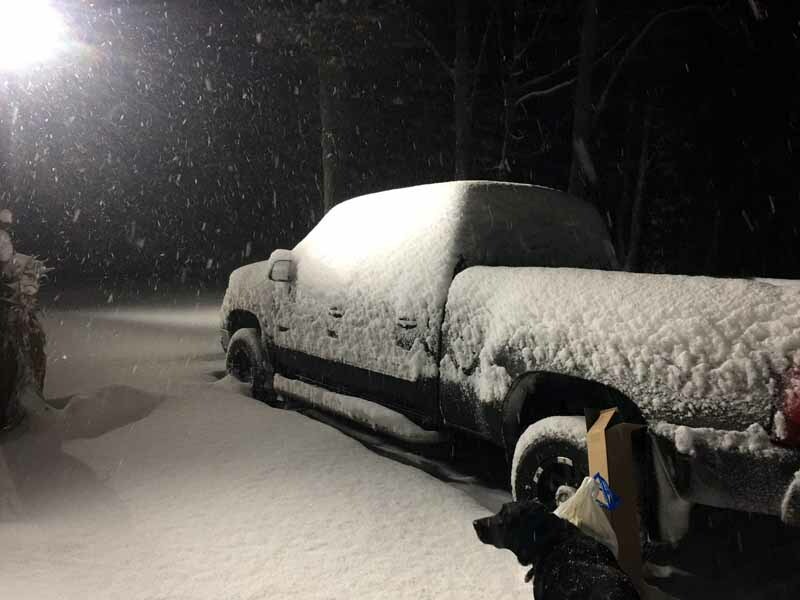 I was looking forward to the drive, not because it was still snowing and the roads were rather slick, but because it would allow me to see first hand how the snow distribution had gone in areas from Mohawk to Greenland in the past 4 days. 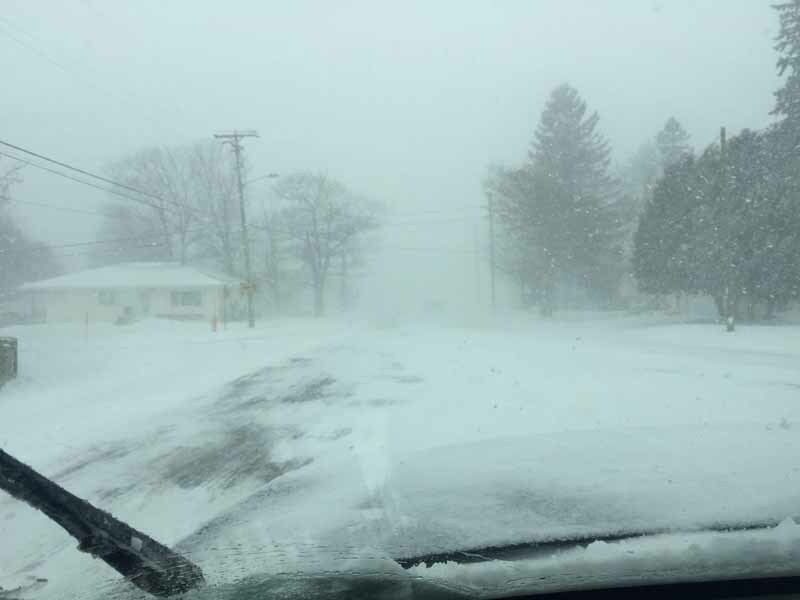 To me it appeared as though all areas had at least 12-15″ on the ground and the two areas that seemed to have a the most were the general Calumet area, as well as from around Painesdale to Donken. 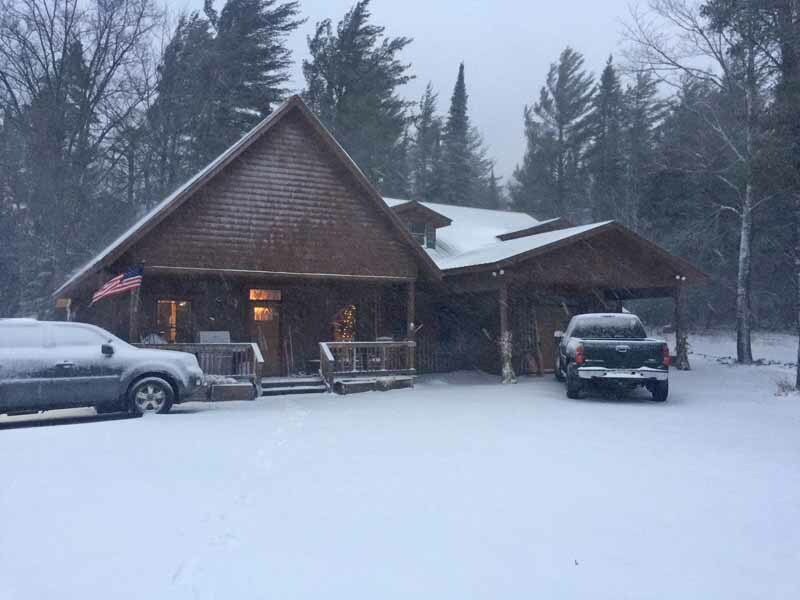 There, the snow looked to be around 18-24″ deep, accompanied with some nice Keweenaw Kamo. All areas up here are grooming what can be groomed. There are a few spots that are too wet to get at right now, but with temps struggling to even get to 20 degrees for daytime highs, they should be freezing up soon. I also know that due to the wet spring, summer and autumn, the logging work got severely delayed and north of the bridge, some sections of trail are not yet open because they are finishing up the logging. 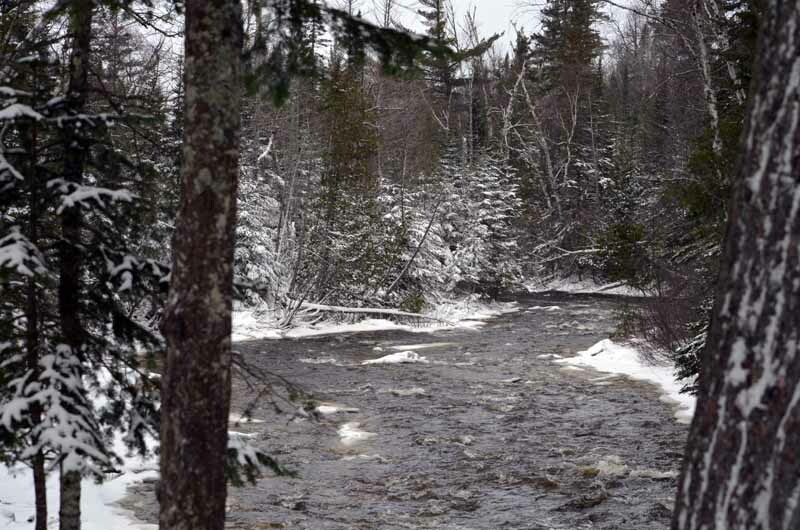 The two main spots are trail 124 from Gay to Phoenix and also trail 132 from Delaware to Lac La Belle. I have been told that they are getting closer to being done and should be by the end of the month. 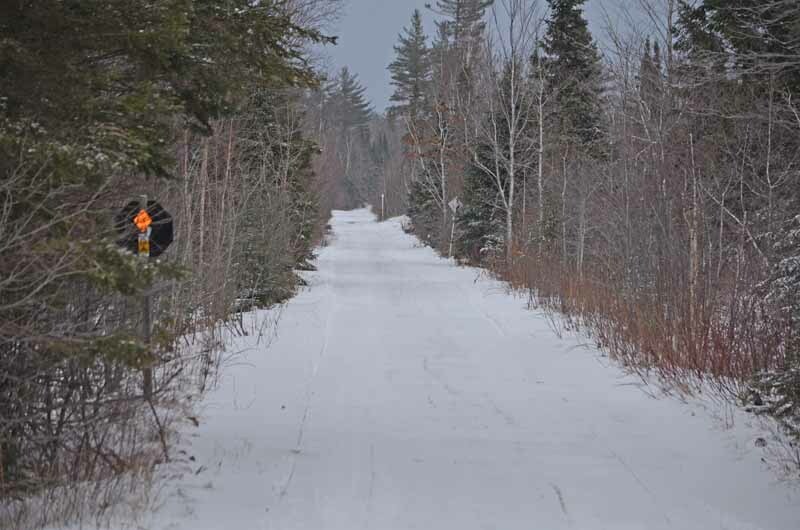 Most other trails from Houghton to Copper Harbor are open and being groomed. So while we did not not open the trails December 1st with bountiful snow, things did change in a big way in a short period of time in the past week up here and with the cold and additional snow this week, they will only get better. 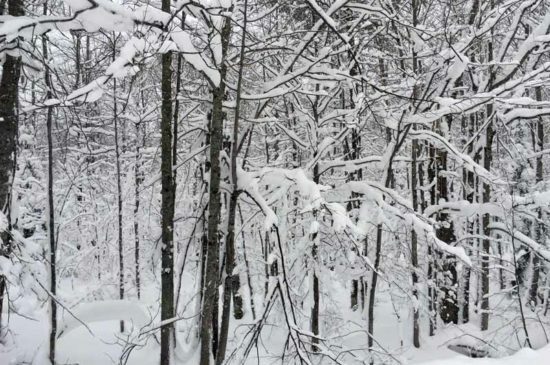 For many areas of the Midwest, the snow conditions we have on the ground right now would be called epic at any time of the winter, but for us, it is called a good start. My final story and pic comes from my activities Saturday night. The old movie theater in Hancock has been transformed into a pizza place and venue for live music. I got my first experience with this place a month or two ago and made another visit last night. 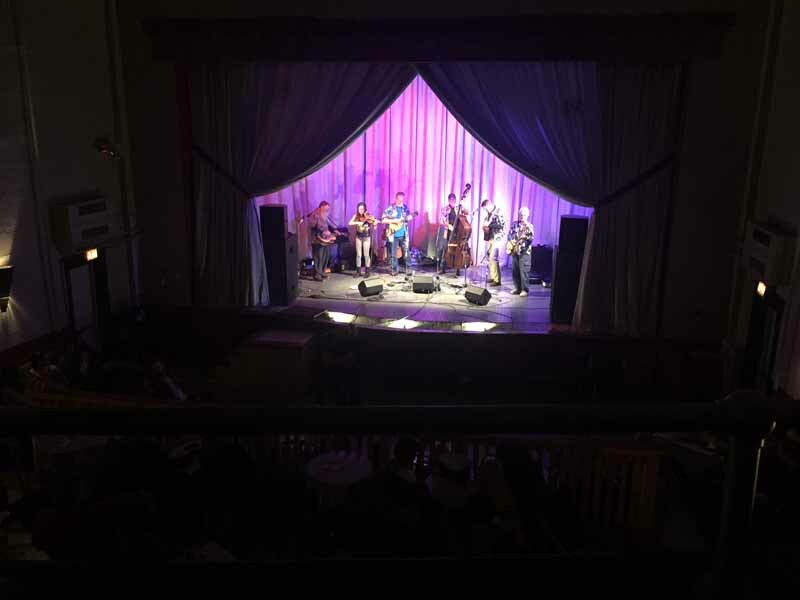 The old theater really lends itself to providing great acoustics for listening to live music, plus it is a really nice and intimate atmosphere, not to mention that the pizza is really good too. They had a blue grass band playing last night and it was great to sit and listen to them, while eating some pizza. The band was excellent and I look forward to seeing more shows at the Orpheum. So I guess that about does it for this one. Hard to believe that in two weeks, Santa will already be flying around the globe delivering his gifts to everyone. It looks a lot like Christmas up this way and looks to stay that way for some time! 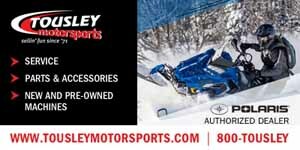 If you are in need of snowplay, we have what you are looking for!